This is not the first occasion a radical, exciting, contentious proposal for large scale changes to the layout of Crouch End has been proposed, but certainly the first for some time. The ‘Liveable Neighbourhoods’ project is the slightly tortured title for an ambitious Transport for London initiative designed to support innovative new road layouts which place the pedestrian and cyclist first – creating a virtuous circle of social, environmental and economic benefits. Over two parts, we’re taking a look. 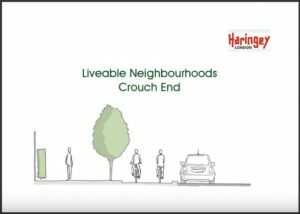 The headline is that Haringey have successfully bid for funding for Crouch End and propose transforming the main drags (an announcement was made in December, the bid document is available here) into a more liveable, appealing space. 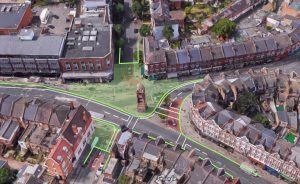 With new cycle routes, better road crossings, redirected main roads, and even a proposed new public square in the centre of town, this is a big deal for Crouch End. Taken together with the Hornsey Town Hall project, it adds up to the most significant transformation of the town centre in decades, and by 2020 you won’t recognise the place… well, that may be slightly overclaiming, but perhaps we’ll soon have two new town squares to drink our coffee in. More later. The Forum discussed the project at the recent AGM and as we await more detailed proposals we thought a precis might be useful. 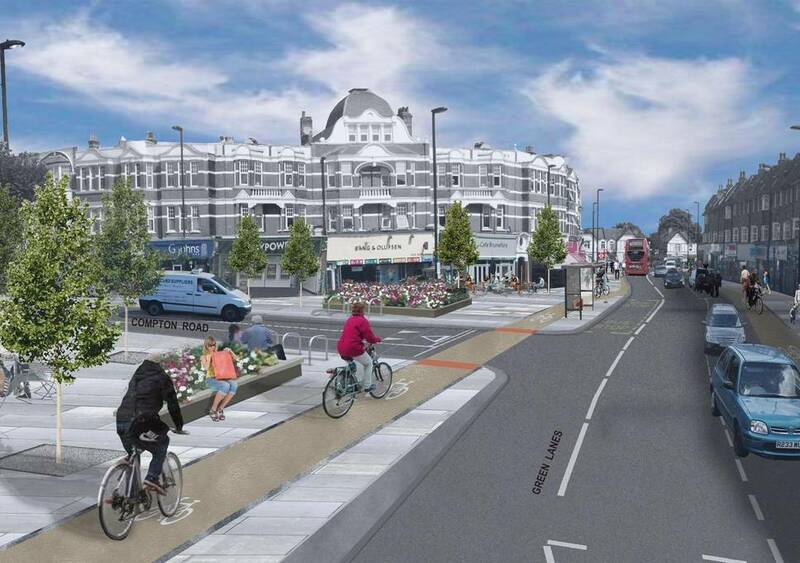 Will, as TfL hope, changes to road layouts and streetscapes lead to liveable neighbourhoods? Is this our opportunity for placemaking? 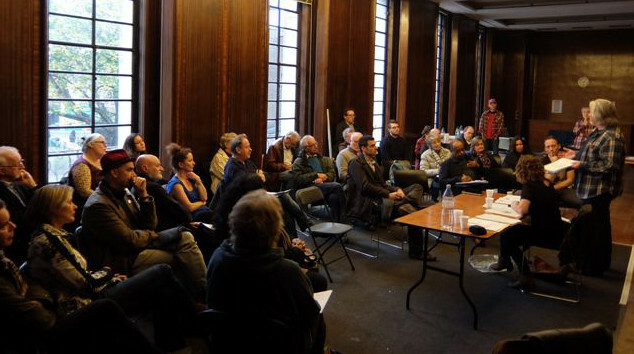 Is placemaking the same as gentrification? Is gentrification a hot potato? – Or is this scheme just tweaking the town centre a little to stay ahead of the risks and uncertainty for the ‘high street’? (NB. The CENF AGM also featured a presentation on the related Crouch End Air Quality Business Project. See below). Go to Part 2. What do they want to do? The Liveable Neighbourhoods Initiative heralds a vision of radically changed transport choices across London – a ‘modal shift’ away from the car. TfL have decided that it would be good for all of us to spend more time walking and cycling “to change fundamentally the way people are able to move around our city” . The vision may proclaim an improved public realm, but the interventions, ideas, and methodologies derive from current transport infrastructure thinking. Thinking that includes the ‘Healthy Streets Approach’, and a growing network of cycle superhighways, traffic management schemes and mini-Hollands – backed by studies which purport to show improvements to local economic and social vitality. In essence, and we like clarity at the Forum, the idea is to make walking and cycling more appealing and pleasant, while making driving more frustrating and difficult – this is about slowing traffic, reducing the road space for motor vehicles (parking too), and in so doing getting people out of their cars. Many – and many not too far from Crouch End. Islington, Dalston, Camden have all had schemes, Wood Green has seen a few, Harringay Green Lanes, Highbury Corner is currently under construction (below), and of course the new design at Archway (ex-)roundabout (above) has recently completed (many are schemes with one side of a gyratory system closed to traffic). 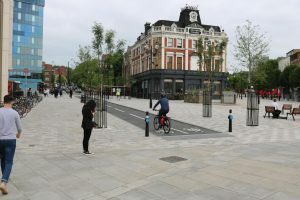 To the East in Walthamstow and to the North in Enfield and Palmer’s Green, ‘mini-Hollands’ of extensive cycle infrastructure have appeared at TfL’s behest in the last few years, cutting back road space for motor vehicles, and curtailing parking. 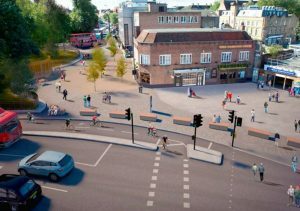 Few schemes have escaped criticism (for instance in Enfield, though evidence is fiercely contested), and there have been protests from some motorists, residents, and local businesses. We’re certainly interested to see studies that map the impact on local traders – though remain wary of the confirmation bias such reports seem prey to. The initial stage winners of TfL’s programme were agreed in November. 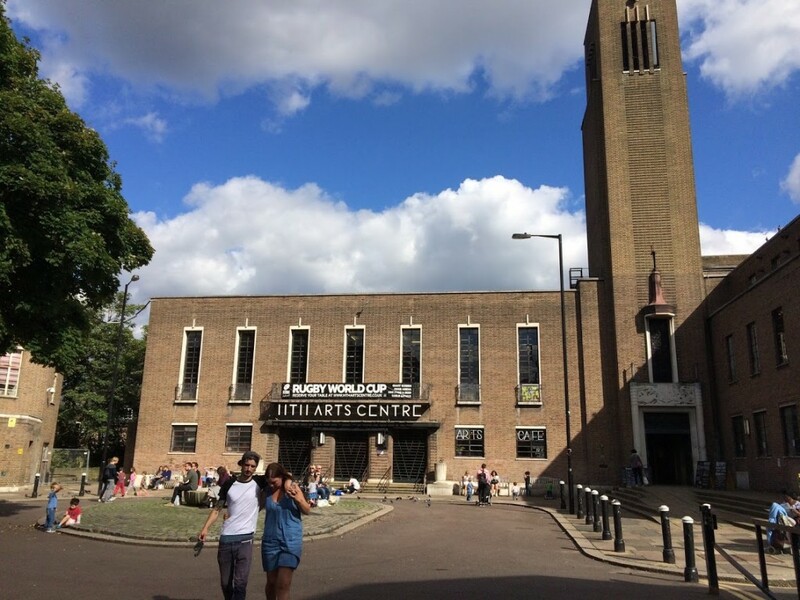 Haringey were successful – with £1.25m to develop the proposals, they are looking at a pot worth £5.8 million if everything comes together. However, it is important to note that much remains conceptual at this stage, and the project requires ongoing support from the new Haringey administration. It would be incorrect to assume any of this will happen. In addition to evaluative gateways in the funding programme, most importantly the scheme includes experimental road testing – redirecting traffic to assess the impact of proposals. If ideas don’t work, they will have to be amended. 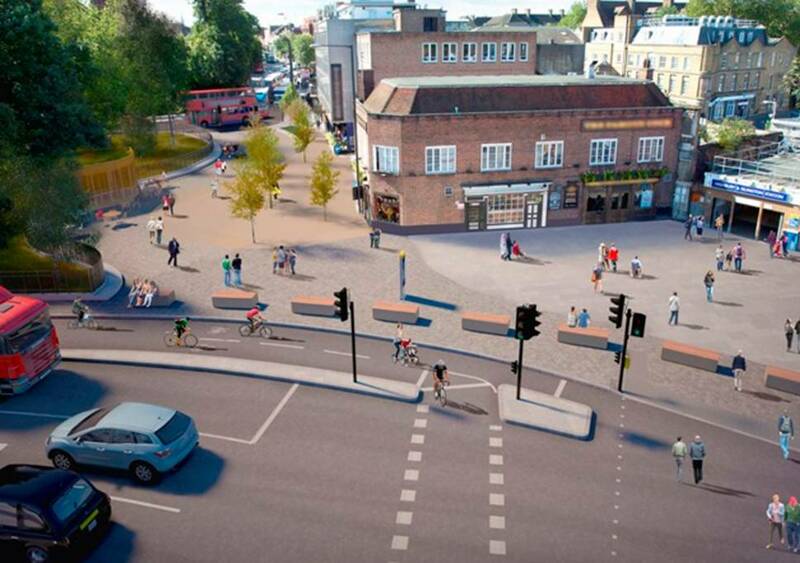 Nevertheless, other places received the go-ahead for radical new road layouts, so why not this? We hope too that the support of the community will be a meaningful factor in decision making. Perhaps one of the stronger arguments relies on the economic benefits. If this scheme increases the appeal and the profitability of the town centre it should be pursued. Local Authorities are increasingly financially reliant on local taxes, and we should remind Haringey that Crouch End is the second largest town centre in the borough. Strengthening the economic performance of CE through improving the public realm may be fruitful for all stakeholders. 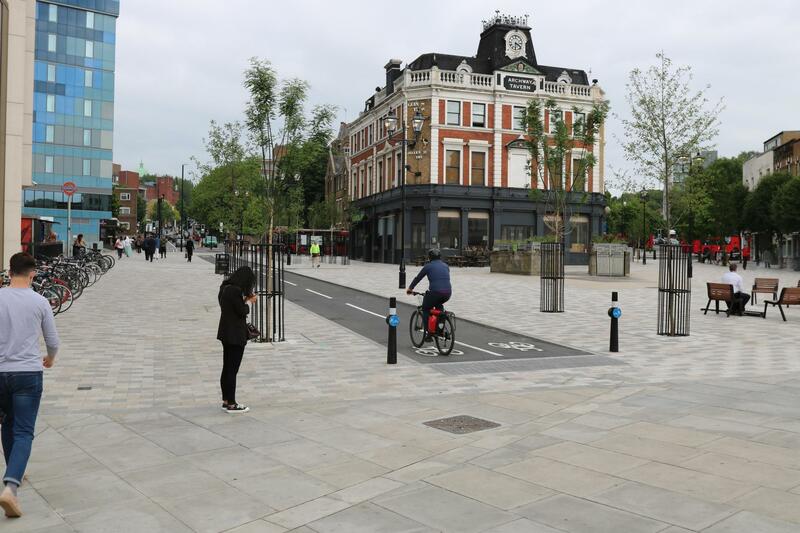 Under the proposals, pedestrian and cycling conditions in Crouch End town centre will be improved to encourage active travel in the area, tackling congestion and improving air quality and residents’ well-being. The proposals look to create a new square incorporating the clock tower, currently surrounded by traffic. 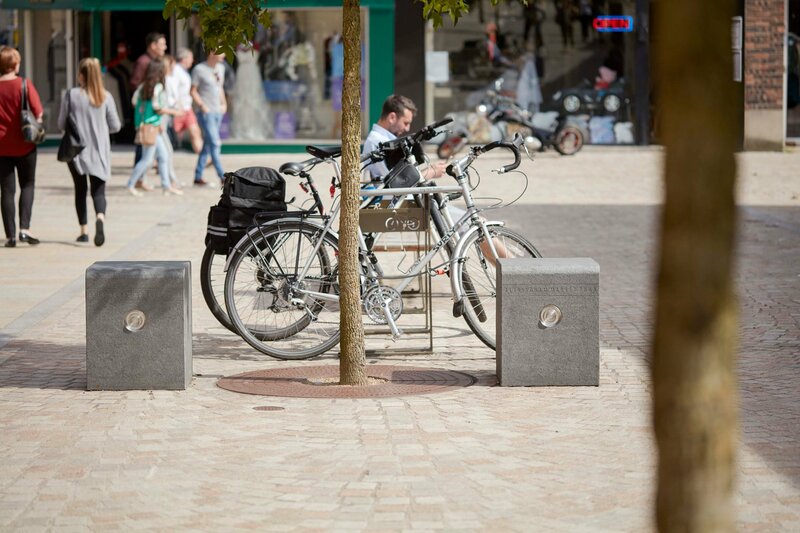 Segregated cycle routes will feed the town centre, pedestrian crossings will be improved and traffic will be reduced on residential streets with new ‘modal filters’. As mentioned above, the point is to address the current dominance of motor vehicles and create a modal shift which in turn improves the public realm. Whether this will actually work is rather key to the endeavour, but there’s much to welcome in a scheme which promises increased space for pedestrians and visitors, wider footways, traffic calming measures, narrow more easily crossed roads, new more appealing road surfaces, cycle lanes, more greenery, street cafés, public art (maybe we’d even get rid of the redundant phone kiosks) – and improvements in surrounding streets with better provision for cycling. 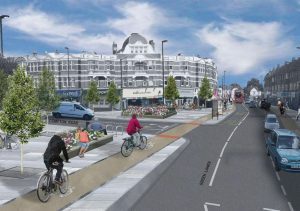 The eye catching proposition is the plan for the Broadway and potentially Tottenham Lane – thoroughfares that comprise the primary shopping area, though one would hope that the benefits of new designs will be felt along the other roads, not least Park Road which actually carries greater traffic than Tottenham Lane. There is much we don’t know, and much to be decided. For example we do not know the route of the main cycle lane through Crouch End, it is identified as running down Tottenham Lane, but then “an alternative route will be provided” before reappearing to go down Crouch End Hill. Neighbourhood Forums are required to represent more than one interest group – and in this context we include residents worried about parking, motorists and bus users, and shopkeepers concerned about trading. Our engagement will have to be evidence based, and the Forum will measure the scheme in a wider context including the local economy, the environment, heritage and conservation, etc. We’ll be carrying out further consultations across all sections of the community – including businesses, but also others such as the CE Festival who may see the value in a new CE square – and establishing priorities. And we’ll be seeking a seat at the table when decisions are being made. It’s not too early or too late to hear your thoughts. What impressions do you have? What changes would you like to see? Please do let us know. In Part 2, a look at the proposals and ideas in Haringey’s bid – including the new clock tower square. There will also be an opportunity to register for free support on deliveries, servicing and active travel, through workshops or one to one support. In addition, we will be offering free cycle safety seminars to local employees. This is part of a project being undertaken by Haringey Council working with Cross River Partnership (CRP). The Council want to make Crouch End a cleaner, healthier place to work and do business by improving local air quality, supporting active travel and helping to reduce business energy and transport costs. Responses to the survey will help them shape their plans for Crouch End, developing interventions that reduce air pollution while saving businesses both time and money. For more information on the programme visit Cross River Partnership, or contact the Programme Manager, Tanja Dalle-Muenchmeyer. The picture of the Archway pedestrian zone in the blog includes a lady utterly engrossed in looking at her mobile phone. The perfect target for a black clad, hooded figure on a moped to swoop across and relieve her of the valuable, to be taken away and sold in Nigeria,perhaps. A correspondent on Facebook has written “Highgate Hill is the worst hit road in London after Holloway. I was very worried about an escalation of crime after the bottom of Highgate Hill was pedestrianised and that has been realised. 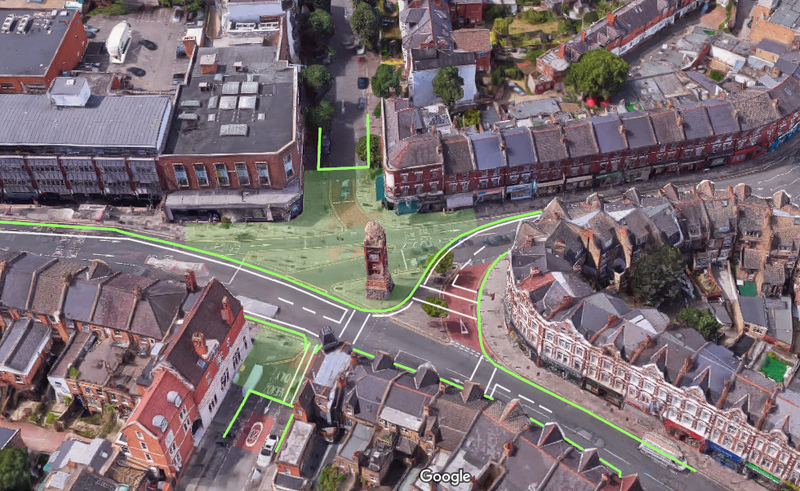 I am very nervous about the idea of pedestrianising an area by the Clock Tower in Crouch End. What could go wrong?” She has provided a link to a BBC piece on the growth of moped crime http://www.bbc.co.uk/news/uk-england-london-44045128 . The Facebook piece is here https://www.facebook.com/groups/768822016566742/permalink/1691784237603844/ While I think her fears are exaggerated, while the possibility exists the designers of any new public space should design it to reduce the ease with which crime can be committed. I assume ‘designing out crime’ will be part of this. Impediments to moped thieves are possible. Seating, bollards, signage, planting, hedges, space for discarded Chinese hire bikes. Or how about a community funded police box? Of course the design should address these concerns, so please show us such a design and consult on that. You have put forward this plan many times with vague statements that issues such as traffic / bus congestion and crime will be ‘designed out’ but until they are, the scheme remains poor, naive and a potential road traffic nightmare. The point right now is that the designs remain conceptual – which is why we’re consulting on priorities. We don’t know what measures Haringey and TfL will ultimately deliver nor have we taken a definitive position, points mentioned repeatedly in the blogs. Would it be better to wait for finalised designs before mentioning anything, or perhaps the Forum shouldn’t report on the most important road changes in Crouch End at all? Not at all, consultation is good, but is there more than one conceptual design to be consulted upon? Are there options? Could there be accompanying written acknowledgement of the issues raised and the positives applauded? All very well to tell Crouch Enders to get on their bikes- my 3month old electric bike was stolen from my front porch where it was double locked and anchored on Wednesday night this week. Police were singularly unhelpful- it took 4 attempts to log the crime via the Met website, then 24 hrs later I received an email telling me they’d closed the case apparently after an investigation which did not include as much as a conversation with me in person nor a visit to the crime site. So much for our public services.